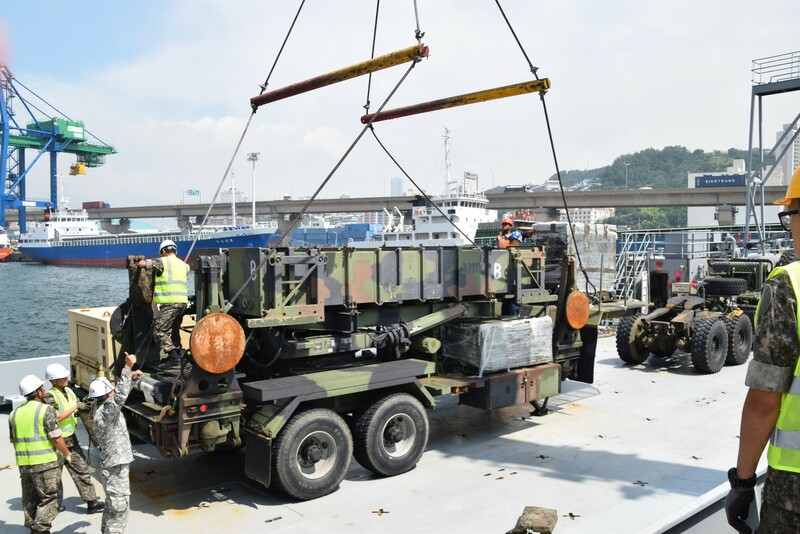 PORT OF BUSAN, South Korea - In a monumental first, 35th Air Defense Artillery Brigade, executed an Emergency Deployment Readiness Exercise, validating the unit's ability to integrate external ballistic missile defense assets into the Korean theater of operation by sea, July 13 at the Port of Busan. "Although we've previously executed similar drills, this exercise was a first, and proof of concept that the Dragon Brigade is mission ready to receive air missile defense equipment by sea," said Cpt. Robert Tuttle, assistant operations officer, 35th ADA Brigade. The Soldiers assigned to B Battery, 1st Battalion, 1st ADA Regiment, out of Okinawa, Japan, arrived at Kunsan Air Base July 9. The Soldiers will exercise their equipment as they train alongside A Battery, 2nd Battalion, 1st ADA Regiment during their two-week field training exercise. They will perform command post operations, conduct maintenance and rehearse battle drills based on simulated combat conditions. 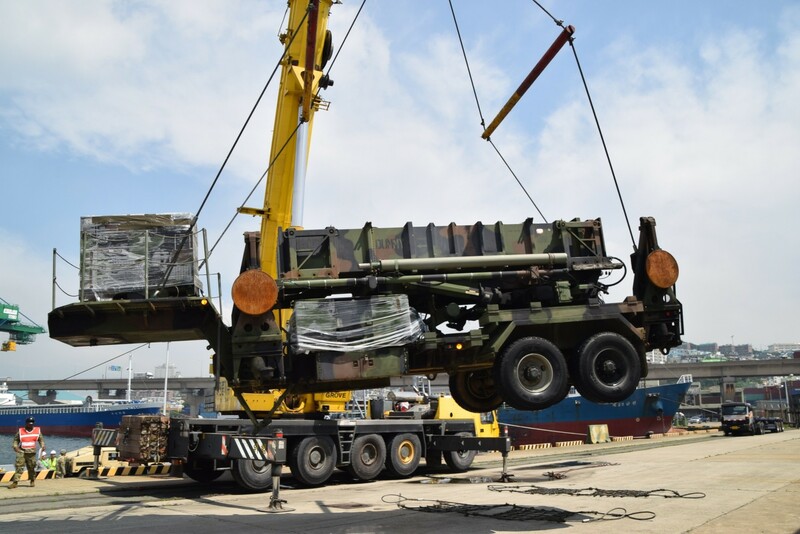 The 517th Movement Control Team, 25th Transportation Battalion provided logistical support of receiving and moving the Patriot missile lunching system, vehicles and equipment from the port to Kunsan Air Base. 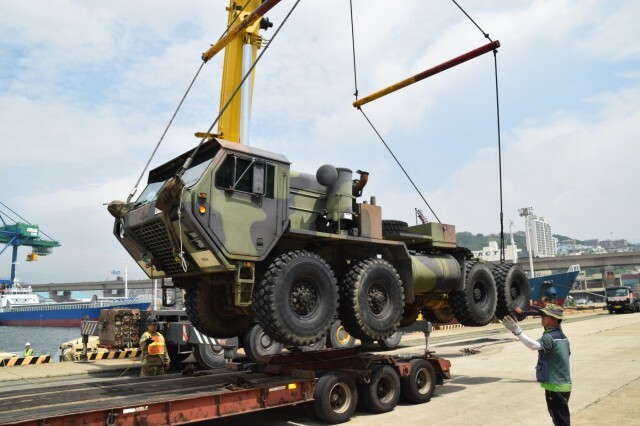 They were assisted by Soldiers assigned to 2-1 ADA Battalion and the Port Operations Support Group, 665th Port Operations Battalion, Republic of Korea - Army. "It really is a testament to the teamwork, effort and coordination that goes through multiple echelons, sister firing units and battalions," said Cpt. Cody Davis, logistics officer, 2-1 ADA Battalion. "What this proves is that we can quickly, and efficiently augment air and missile defense onto the Korean Peninsula." The United States Army Vessel Harpers Ferry (LCU-2022), assigned to 10th Regional Support Group out of Okinawa, Japan is credited with moving the historical payload between the two ports.